Is there anything more mesmerizing than light dancing upon crystals? Certainly not when you see it at play among the cluster of clear crystal droplets that dangle so delicately from this two-light wall sconce. A brushed nickel finish takes the look from appealing to hypnotic. From Vienna Full Spectrum™. 13 3/4" wide x 9 1/2" high. Extends 6 1/2" from the wall. Backplate is 4 3/4" wide. 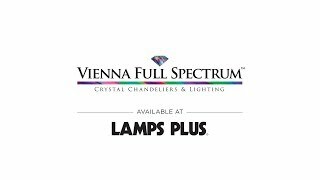 Regina 2-light wall sconce from Vienna Full Spectrum. Add glitter to bathroom or vanity areas, hallways, and more. Brushed nickel finish with clear crystal drops. It looks elegant. I'm hoping it gives good lighting on the sides of my medicine cabinet. It is perfect. I will have one on each side of my linen closet. I love this modern take on "crystal" light fixture. Do you have spec sheets available for these? BEST ANSWER: I am sorry, a spec sheet is not available. But, the measurements and specs are listed on our website for this item. Could this be used in a small guest bath over the mirror - just for company, no tub or shower? BEST ANSWER: Hi Susan - sure I do not see why not. 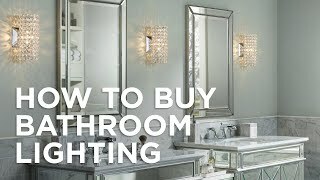 I have also added a helpful link below to help you find the right bathroom lighting. can this be use in a bathroom with a shower? I have the chandelier and it is fabulous. I purchased the wall scones for the foyer stairwell next to the dining room. The chandelier hangs the crystals using hooks - I had mounted the wall scones (on a stair well) when I discovered that they used split rings to hang the crystals. It was impossible to hang them. I ended up purchasing s-hooks at a craft store and replacing all the split rings (hours of work). It isn't clear why they used a different hanging device on the wall scone (vs the chandelier) but the patience and dexterity required to hang dozens of crystals was beyond me. 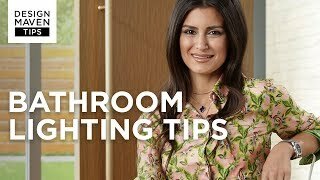 This is such a great sconce without being over the top! The dangles are simply glass drops, not cut as are crystals. It reminds me of raindrops and is perfect for my daughters room. We are going for a rainbow room, with clouds and a little bit of rain mixed in! Very cute, looks great! Adds a touch of elegance! Very elegant and sophisticated vanity! I love it!